The article below is a good resource that scratches the surface on how to motivate teachers. 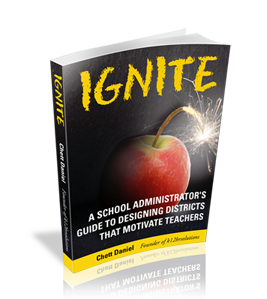 If you are looking for more in-depth and actionable information, we have an entire book that provides school leaders with a guide to designing districts that motivate teachers. For more information click on the image above. These strategies seem logical, but based on research (and the fact that districts that say they use that method were actively searching the internet for ways to motivate teachers) incentives and praise aren’t enough to keep teachers motivated. Today’s article is an excerpt from our ebook Ignite. We want districts to think strategically and holistically about how to motivate teachers. This article, and in much greater detail the free ebook resource we offer, examines structural factors within school district operations as well as policies and procedures that can either help or hinder efforts to motivate teachers. We know if teachers aren’t motivated then students aren’t pushed to their full potential. In the end, that is our ultimate goal. Motivated and engaged teachers = motivated and engaged students. These factors require more effort than offering incentives. School district leaders must be willing to step beyond quick fixes and be willing to communicate and listen to what teachers are saying or the data received in climate surveys. If you recall from part 1 of “How Do You Motivate Teachers?” incentives and rewards can increase the quantity of behaviors, but have not been found to increase the quality of performance. Reorganizing teachers’ job context in factors beyond rewards, have been found to increase both quality and quantity of performance for employees. Individual attributes of the teacher and the context in which teachers work combine to influence motivational processes. Below is a path analysis that illustrates correlations between various factors that lead to job satisfaction or the decision to leave a school district. As you can see, feeling valued, having a good report with school leaders, and strong relationships with colleagues combine to strongly affect a teacher’s sense of belonging. The sense of belonging is shown to have a significant correlation with job satisfaction. Meanwhile, time pressures and discipline problems combine for a strong relationship to emotional exhaustion among teachers, which in turn is strongly correlated to the motivation to leave. Also notice the negative correlations between emotional exhaustion and belonging, emotional exhaustion and job satisfaction, and motivation to leave and job satisfaction. Negative correlations simply indicate as one factor increases the other decreases. For example, as the sense of belonging increases, feeling of emotional exhaustion decreases, or as job satisfaction increases the motivation to leave decreases. What’s interesting here is how some of the factors are seemingly unrelated, but have significant consequences on teacher motivation. The feeling of belonging has little to do with the mental and physical strains of teaching that lead to exhaustion, yet if a teacher feels like they belong within their school district and feel like they are part of the team, they are less likely to feel exhausted, even if job factors are overwhelming. Expectancy in motivation is exactly what it sounds like. It is a theory that asserts people tend to make rational decisions of whether their effort will lead to outcomes they value or expect; it is a probability assessment. The factor of expectancy combines with a few other factors to help educators decide how much effort they should put forth. If teachers and principals feel helpless in reaching the goals the school district or state has put before them, or if the rewards that are being offered, i.e. pay, bonuses, recognition, or other forms of reinforcement, expectancy levels will be low. If school districts break up large goals to smaller and more achievable goals, if they ensure basic resources for teaching are in place, and promote a community of everyone working together to achieve common goals, the district is more likely to be successful. This environment of support along with valued rewards, such as pay, can combine to encourage educators to persevere in the face of challenging circumstances. Self-efficacy is another important factor when asking how to motivate teachers to be more effective. It is the belief in one’s own abilities to meet situational demands of a task. The idea is a basic one. People who think they can perform well on a task tend to do better than those who think they will fail. School districts would do well to identify essential competencies for beginning teachers in their respective school districts and ensure mentoring programs are structured to reinforce these skills early in a new teacher’s career. Strong mentor relationships should be established to help new teachers feel confident in core abilities and behaviors that lead to student success. Self-efficacy seems to be related to past performance or at least perceptions of past performance. Administrators can increase self- efficacy in teachers by communicating high expectations and providing the resources and support to achieve those expectations. Research has also shown that self-efficacy is reduced when low expectations are communicated. The lesson learned here is set ambitious, but realistic goals for your staff and ensure they have the resources available to achieve those goals. Why is all this talk about self-efficacy important? Terrance Mitchell and Denise Daniels have conducted and reviewed empirical research that found those with higher self-efficacy put forward more effort towards a task and persevere longer, they focus attention better, choose more difficult goals, seek feedback to improve performance, and choose more efficient task strategies than those with lower levels of self-efficacy. Administrators can improve teacher performance and student performance; affect motivation by increasing self-efficacy. What does all this about self-efficacy mean for a school district? It means training and development plans for new staff members are absolutely essential. Remember, this entire post is focused on how to motivate teachers. It is difficult to imagine being able to effectively motivate teachers to higher levels of performance if you don’t have an environment that supports feelings of belonging, have forms of reinforcement that are valuable to your staff, and implement training and developmental resources that increase self-efficacy. Finding ways to motivate teachers isn’t as easy as rallying the troops at the beginning of the school year. The answer isn’t always a matter of providing better incentives or rewards. It is a well-developed and deliberate organizational plan that everyone must be committed to throughout the school year and during entire course of tenure for each teacher in the school district. If a school district is looking to improve student and teacher performance, improving motivation among teachers is a good place to start. If you found this post useful, you will love Ignite, the book we highlighted at the beginning of this post. K12 HR Solutions is a human resource consulting team that specializes in human resource needs of k-12 school districts. Members of our team have strong backgrounds in human resources, management and leadership, education, and organizational effectiveness. Our team members specialize in industrial and organizational psychology, a strategic human resource degree, that focuses on individual and team behaviors that result in desired organizational objectives. Contact us and let us help you motivate the teachers in your district. Ohio State University created the Ohio State Teacher Efficacy Scale (OSTES). It is written in both a short (12 question) and long (24 question) form. Essentially, the researchers found that all answers load into three factors: Efficacy of Student Engagement, Efficacy of Classroom Instruction and Efficacy of Classroom Management. What I have implemented and what you have touched on is a mentoring program for all new teachers centered on efficacy. It is a 3 to 4 year process that covers classroom mangement, classroom instruction and student engagement. The goal is to create competent and confident young teachers who will experience success and continue to grow and teach. That sounds like a fantastic mentoring program that builds a supportive contextual environment for new teachers. Not suprisingly, mentoring programs, like the one you described, have positive relationships with reducing turnover. I am going to see if I can find out more info about the scale you described. Thank you for bringing this up. You mentioned that mentoring program, like the one I have created, have positive relationships with reducing turnover. Could you please point me in the direction of any evidence for that? Also, earlier in the original post you talked about job satisfaction and employee motivation. Are you familiar with the work of Frederick Herzberg? He has a compelling theory: Two Factor Theory. If you are not familiar with it I would strongly suggest that you acquaint your self. Sheridan, J.E. (1992) Organizational Culture and Employee Retention. Academy of Management Journal, 35, 1036-1056. I didn’t read the actual article, I ran across the finding in the Handbook of Psychology Volume 12 for Industrial and Organizational Psychology in a chapter related to organizational climate and culture. Thank you for the additional information. I’ll check it out. I have worked with hundreds of teachers, one on one, and the greatest motivation I have ever seen is the experience of truly having made a difference. It is an internal and genuine experience that can only exist in the convergence of heart and opportunity… the results are pure magic. its very easy if the motivation can be done with human touch after all teachers are human beings first. its very easy if the motivation can be done with individual diference on the aspect of capacity and experience. its very easy if the motivation can be done with proper feed back and apraisal.